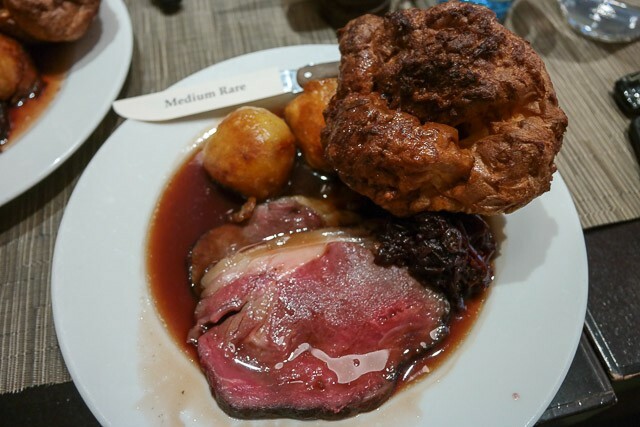 We reviewed the Sunday lunch at Chapter One in Farnborough (Bromley) about 2 years ago – it scored a Top Rated award. 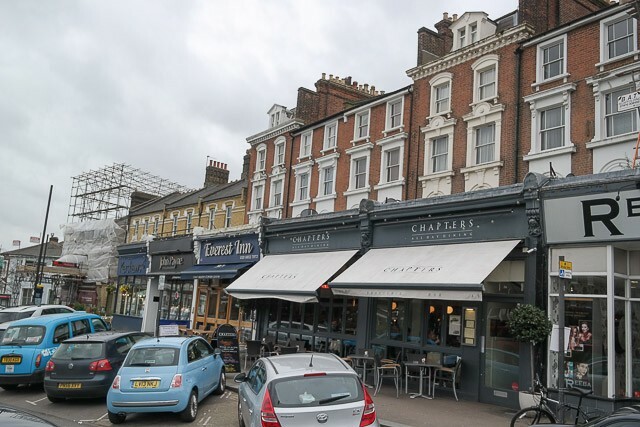 I knew of Chapters (their sister venue) in Blackheath and decided to give them a shot. Booking was simple, I just used their online booking form, and we were all set for Sunday lunch at 1pm. Whilst there were some parking spaces outside the parade of restaurants and shops, they were all full – I managed to get a space on the main road, but it was a bit of a challenge. Chapters is opposite the heath, and very close to the entrance of Greenwich Park, so a great location. Outside were some chairs for al fresco dining (it was far too cold for that!). We were met at the door and show to our table in the corner of the restaurant. They brought over a booster seat for our toddler, JW, to sit on. The seats were comfortable, and the table was laid out with paper napkins. We have a view over the heath through the large windows at the front. It was a smart restaurant with a few families dining. Claire ordered a glass of house red (£4.50 for 175ml, so quite reasonable) – I ordered a large bottle of sparkling water. We decided to skip starters and go straight to the main course (why wait!). We were brought a nice selection of bread to nibble on whilst waiting. They only offered roast beef for Sunday lunch – so we both ordered that (we were asked how we would like it cooked – Claire asked for well done, I requested medium-rare). JW had a children’s roast beef. 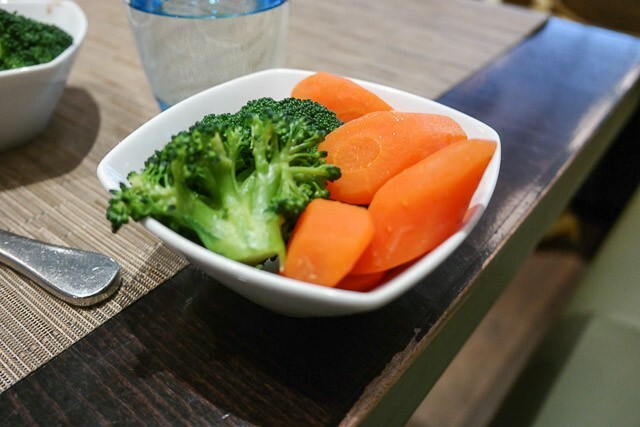 The roasts came out quite quickly – the plates had two slices of beef, a large Yorkshire pudding, two roast potatoes, red cabbage, jus and a bowl of carrots and broccoli (to share). JW had a smaller version, with one roast potato. The beef was AMAZING! Really tender and delicious. The roast potatoes were perfect, being golden and crispy as well as quite large. The carrots were nice and sweet, a perfect Yorkshire pudding and good jus. Certainly a great Sunday lunch. JW was off gluten and dairy, so we were pleased to see a large selection of sorbets on the menu. Claire ordered mango, raspberry and banana to share with him. 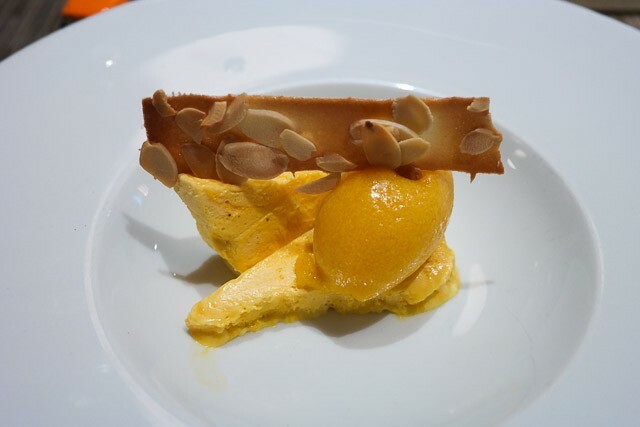 I was intrigued with the Mango Parfait, as it had calamansi sorbet (which I have never heard of, but my favourite search engine told me it was a sour citrus fruit) – dutifully ordered. 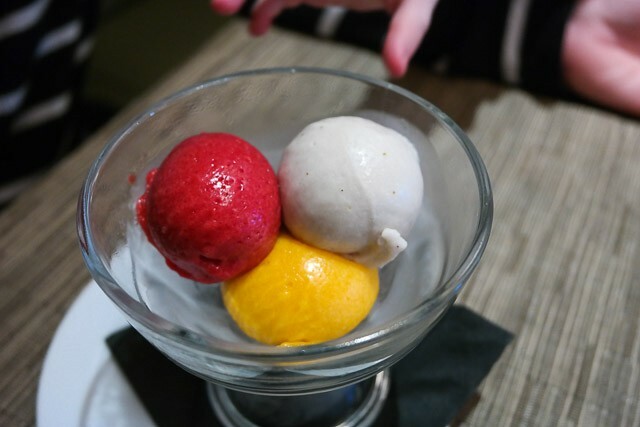 The sorbet came out, with huge, brightly coloured scoops! They both really enjoyed them (I tried the banana – delicious). My dessert was wonderful – delicate and fresh, a perfect finish to the meal (along with the cappuccino I ordered). We did need to use the baby changing facilities – all in good working order and very clean. The high chair / booster seat worked fine. The staff were welcoming with JW, the manager was surprised he was happily eating the roast beef. I have found on their site that they offer a “Kidz Card”, so they are trying to appeal to families, which is a good thing – all the children there were very well behaved, it didn’t feel like a crèche. I was also pleased they were able to offer a child’s roast beef, and at quite a reasonable £4.95. Chapters had a lot to live up to after our great experience at the sister venue, and it didn’t disappoint. The style was more laid back, but still a two AA rosette so not a fast food joint! The service from our waiter was perhaps a bit too aloof for my liking, but he was still professional and polite (we went for the food and experience, not to make friends). The food was excellent, lots of it, high quality and delicious – especially the roast beef and potatoes. 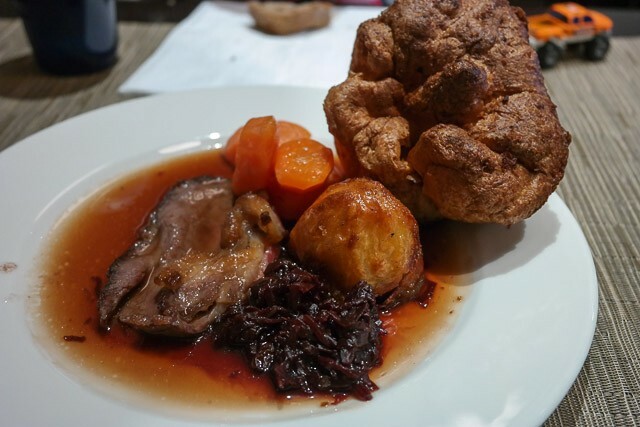 Overall, a Top Rated Sunday lunch at Chapters in Blackheath – suitable for celebrations and when you just fancy a great roast.